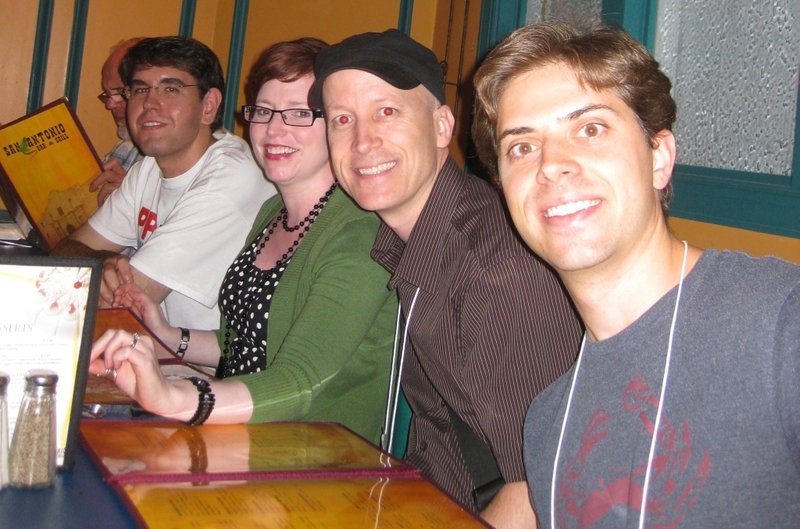 The Third day of IPP is what some would regard as the main event. It's the say of the Puzzle Party, a chance for puzzlers to buy new puzzles and designers and builders to sell their puzzles. I was very much looking forward to the day both to be able to pick up some new puzzles to add to my collection and also because I'd been making a few copies of the Hex Stair by Derek Bosch which I was planning to sell on the day. I also had one copy of the Unhappy Childhood I'd made last year still available so I took that too. The day started fairly early, with the sellers getting into the room around 8.45 to be able to setup their wares before the doors opened to the throngs at 9am. I only had around a dozen puzzles with me, so it wasn't going to take long to get organised, however I was still there early to get setup, and also to take advantage of being able to wander the room before the rest of the buyers were let in. At least that way I knew where the couple of people I really wanted to visit were and I could make a bee line for them when I got a chance. 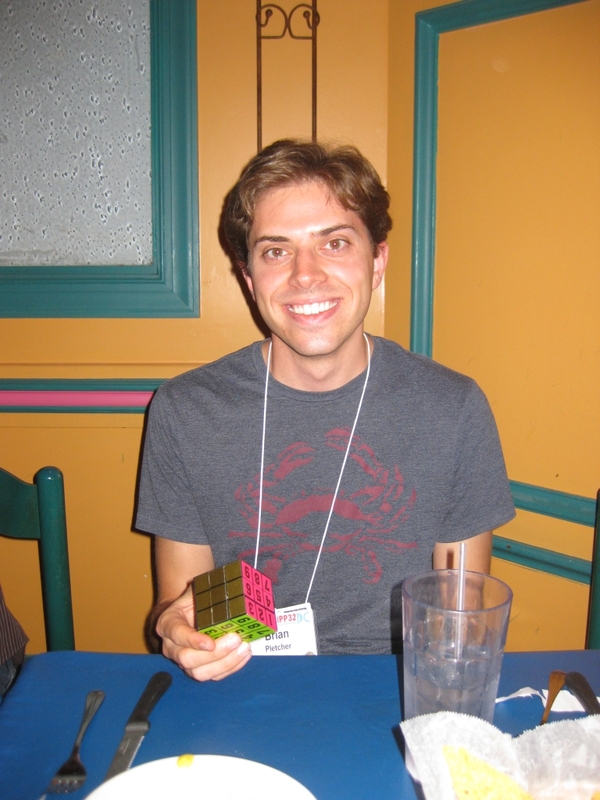 Fortunately Derek Bosch was sharing the table with me so that he could gauge interest in his Rhombic Maze Burr Puzzle which meant I'd be able to get away from my table to shop. Thanks to Rox I was able to grab this pic of me sitting at my table. I'm talking to Derek at this point, and the black and white object in the left of the photo is his RMB. This must have been around 40 minutes into the sale as I've already sold a couple of the Hex Stair Puzzles. I've added a photo of Derek's maze burr below. If you're interested in a copy, then let me know and I'll put you in touch with Derek. He's taking orders currently, with two sizes which will be available. I've played around a little with the puzzle (and hope to be reviewing it soon) and I really like it. It can be configured anywhere from ~50 moves to ~400 moves to open it, all with the plates provided, so there's certainly no end of challenges there. Derek plans to have a book with the various plate configurations so you can set it to whatever level you feel like tackling. As a seller it's interesting to see who comes to look at what you have, and those who look but don't touch, touch and then apologise when the puzzle separates in their hands and they then hand it back sheepishly, and those who try to get it back together. All told the puzzle on my left was picked up and handed back to be put back together most often. I certainly enjoyed the experience as a seller. I managed to sell all of the puzzles I'd brought, and also had a fair amount of interest in either slightly different sizes or sets with the same woods for a Domino Tower and a Hex Stair. All in all a pretty good day. I'd also taken the copy of my first ever puzzle box with me (you can see it to my right in the photo) and it had a reasonable amount of attention as well, with a number of people asking when it would be available for sale. So it seems like I have some work to do to get the box working the way I wanted, and iron out the issues I have with it. Maybe there is a demand for it after all. I did have one incident, when William Waite came to buy one of the Hex Stair's. When I picked it up and when to show him the movement, a couple of glue joints gave, and the puzzle broke into slightly more pieces than it should have been. Clearly I couldn't sell it, so I apologised and put the pieces in the bag I had under my table. Fortunately Stickman happened to be sitting behind me, and had a repair kit with him, just in case he needed it for any of his puzzles, and he'd also fixed a couple of broken competition entries as well. I knew Robert had a kit with him as I'd used it to repair the copy of "Genie in the Bottle" which was made by a friend of mine as the back piece was starting to come away from the puzzle towards the bottom, through a lot of use over three days. Fortunately I was able to borrow the repair kit, and so sat and fixed up the puzzle. A little sanding to remove the old glue (since I didn't have a razor) and then I was able to use the puzzle itself as a jig to ensure the pieces were kept in the correct locations. After about half an hour the puzzle was fine, but I decided to put it back in my bag and not sell it. I certainly didn't want to have it break again before the glue was fully cured. 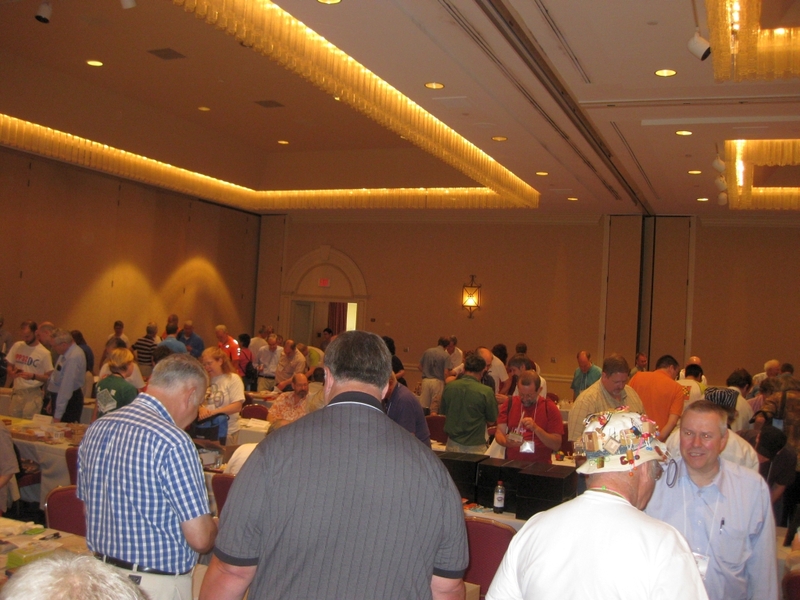 As you can see the puzzle room was full of tables with puzzles from every genre, and a lot of very eager buyers. I was fortunate to be able to get most of the puzzles I was looking to buy from the exchange, and also picked up a few copies of puzzles which were in the Design competition that I really enjoyed too. I know it seems cruel to keep teasing you with the promise of reviews, but I will start reviewing all the puzzles soon, I promise. Toward the back of the room Rocky Chiaro was sitting with a table full of his puzzles. I managed to play with three of his bolts and solve them fairly quickly. It was great to talk to him about the puzzles, and how they're made. He was very happy to show off his puzzles, and to know that each and every one is made by hand, no CNC machining is truly breathtaking. I was hoping to be able to get a copy of his Harley puzzle but he didn't have any left by the time I got to his table. I'm sure I'll be able to get one from him from the website, but I can recommend any of his puzzles. The craftsmanship is excellent, and Rocky is a great guy. As things were winding down Chinny showed me one of his run spinning tops made from gluing together coloured pencils then turning them on his lathe. This particular one is pretty hard to keep down and will hop back up after you knock it over. Not really a puzzle, but a lot of fun, so I ended up taking that home with me too. After five hours of buying and selling puzzles things were wrapped up and people kicked out of the room so it could be switched around for the day's lectures. Bret Rothstein, talked about the earliest known piece of art that features a puzzle and gave some insights into what the puzzle represented and how it was viewed by the artist. 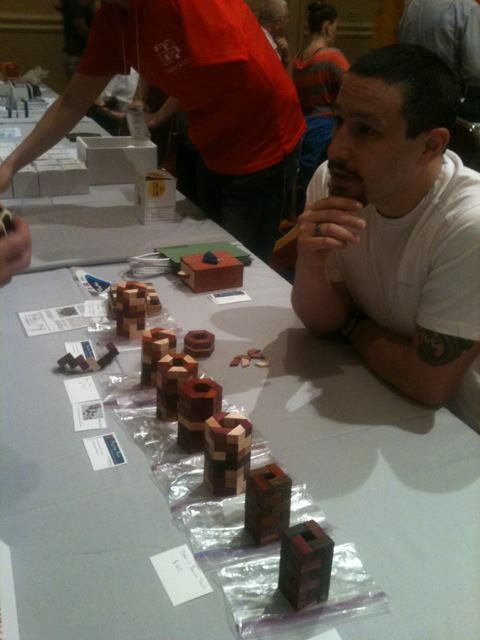 He also talked about some of his own work in reproducing some old wooden puzzle designs. Markus Götz then talked through the construction and solution to his IPP31 "Berlin Wall" host puzzle which was an interesting insight into the creation and thought that goes into making a host puzzle. Johanna Hottola then talked about about Pulma-hanke/The Puzzle Project a fascinating project to bring puzzles into more people's lives and use puzzles to help children and the general people of Finland. Finally, Eric and Martin Demaine from MIT, who talked about some of their latest puzzle-related research including problem difficulty and ended with an amusing video of a human dice rolling problem which looked like it might have been a little painful. Saturday night is left for the puzzlers to do their own thing so we got a few good friends together and headed to one of the local places to eat. During dinner there were a few puzzles handed around which seems to be the norm for anything surrounding IPP. 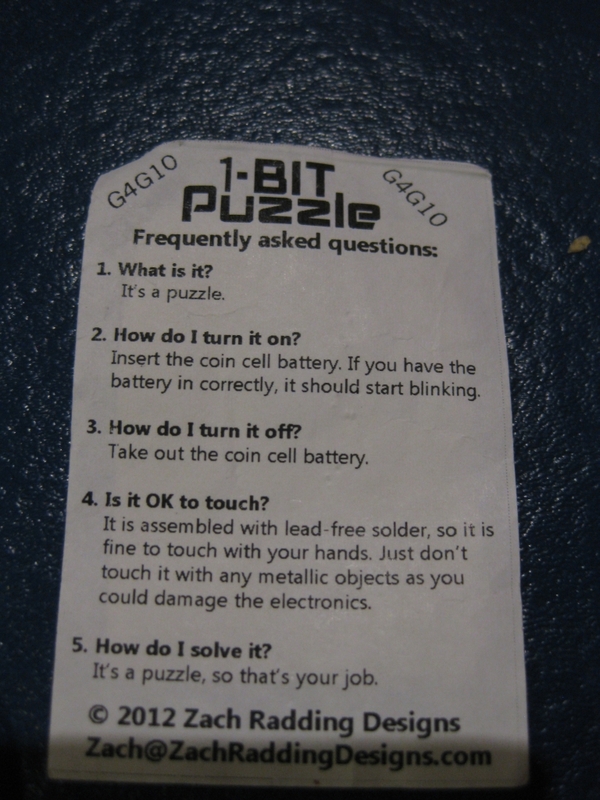 One very interesting puzzle which was handed around was the 1 Bit Puzzle. This is a puzzle from the Gathering for Gardner 10 meeting. The puzzle was a tiny circuit board which had a little blinking light (hence 1 bit). The idea was to decode the blinking light to solve a puzzle. Based on the discussion, the initial blinking led you to a website. From there, you put the puzzle in the cold, and the blinking would change, leading you to put the puzzle near a radio tuned to a particular station, which led you to something else and so on. It sounded like a fantastic little puzzle, which so much being put into such a small package, and would probably have been a lot of fun to play with. Before long someone produced my nemesis, the Rubicks cube. This one had a rather shocking secret to it though which got Brian so well, he gave out quite the shout and dropped the puzzle on the floor. 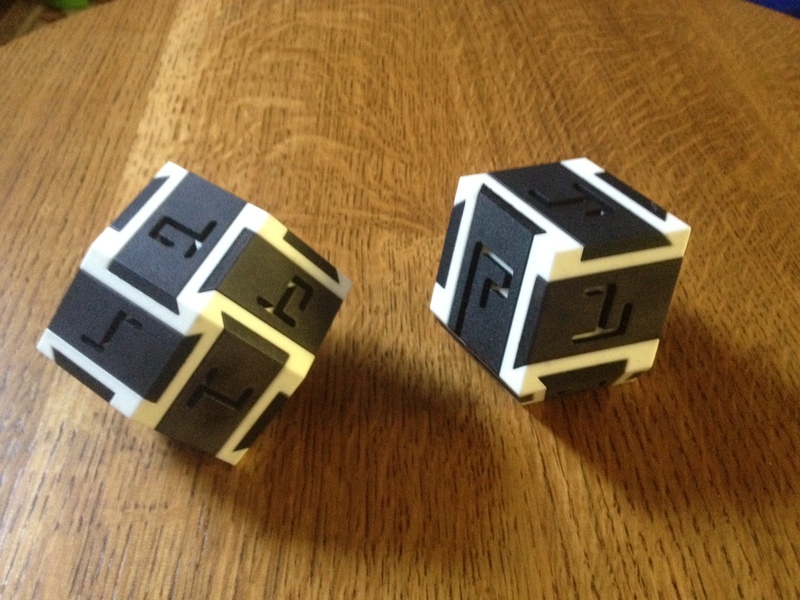 Despite expecting it, it seems that this little cube packs quite the punch! After dinner it was back to the hotel to play with more of the design puzzles. Since Brian had the key to the puzzle room, there was little chance of us missing anything! I had made pretty good progress through the puzzles, and had narrowed down my favorites so I had a pretty good idea which puzzles I'd be voting for. With only one day left I didn't have a lot of time to finalise my decisions. The final day holds the Awards ceremony and I'll cover that in the next post, so come back tomorrow for that. It’s a good thing no one gave me that shocking Rubik’s cube! With my recent terrible twisty habit, I would be found dead or unconscious under the table! I’d never be able to resist playing with it!! PS going to have to talk to Derek about his puzzle! !